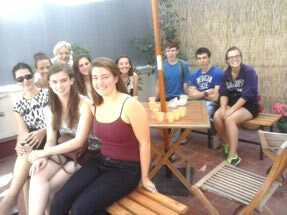 TEENS SUMMER CAMPS & SPANISH IN BARCELONA WITH SPORT CAMPS, SPANISH IMMERSION AND CULTURAL PROGRAMS WITH HOMESTAY. SPANISH PROGRAMS FOR HIGH SCHOOL STUDENTS. SPORT CAMPS AND EDUCATIONAL TRIPS. CUSTOMIZED GROUP PROGRAMS IN BARCELONA. 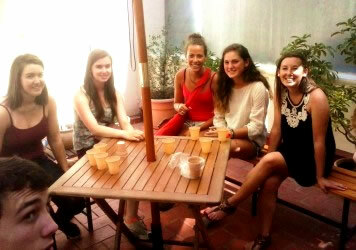 SOCCER SUMMER BARCELONA, TENNIS CAMP BARCELONA, SWIMMING + SPANISH BARCELONA, BASKETBALL + SPANISH IN BARCELONA. CULTURAL PROGRAMS AND FLAMENCO IN BARCELONA. Intensive Spanish Courses Monday through Friday in the mornings, from 9:30 am to 1:30 pm. All learning material is provided at school according to the students levels and it is included in the program. Classes are fun and dinamic. Students are placed the first day at school in groups according to their level of Spanish. Classes are organized for groups of 6 to 8 participants with a similar level of Spanish and similar age. 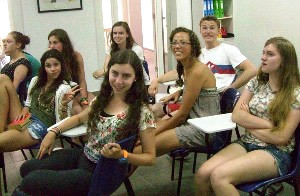 Participants of the Tennis Program attend classes together with the participants of the Spanish Immersion Programs and the Swimming Programs. They will be placed with the right group/class the first day of program. Classes are taugh by our professional Spanish teachers with years of experience with teeangers students. SpainBcn work book is provided for the Spanish classes and it already included in the program cost. 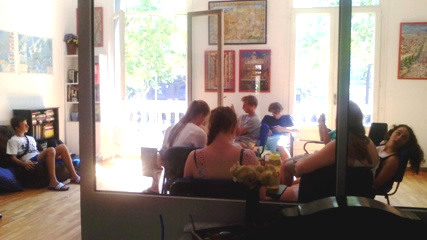 Our students practice and improve their level Spanish quickly. SpainBcn Spanish teachers are native of Spain and they are professional teachers with years of experience with young students and they all love their work. Ou teachers prepare the learning material that will be used in the class acording to the level of the students they have in class each week of the program.They make sure Spanish classes are fun and interesting for the students. All participants will improve their Spanish very much. * Certificate of Studies at the end of the course (upon request). * To those students interested, SpainBcn-Programs will give documentation of studies with a certificate of attendance and letter grade or final exam upon request. For many of you, this is all you need to receive credit directly through your own school so, make sure to investigate this possibility with your Spanish teachers or Department before you finish your school year!! 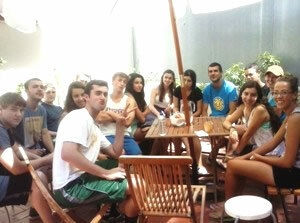 CLASSES CUSTOMIZED FOR YOUR GROUP: The Spanish classes and the program in Barcelona can be customized for your group. Content and duration of the lessons can be customized. Inform us about your needs or preferences. Our Spanish Language School is located in the very center of Barcelona , in one of the nicest and more tourist areas: between the main and elegant avenues of Passeig de Gracia and Rambla de Catalunya. There are less than 5 minutes walking distance to Plaza Cataluña and Las Ramblas. This is one of the most tourist parts of the city and the heart of the Modernist Route of Barcelona. It is also a very nice residential area, very busy, where you will find all type of restaurants, shops and luxury brand stores. At school students have free internet access and they can receive phone calls. Students have all learning material they need for the Spanish lessons. There is also a big library with lots of information about Spanish Art, Culture, History, traditions, etc of Spain and Barcelona.